All over the planet, scientists, doctors, and patients are recognizing the healing power of Medical Cannabis, aka “Marijuana." We are honored to join these pioneers to help patients access Medical Marijuana for Crohn’s disease, ulcerative colitis, or other gut health challenges. As these researchers and open-minded patients are finding, Medical Marijuana for Crohn’s is proving to be an effective treatment option. This article brings you verifiable scientific studies, doctor’s opinions, and patient experiences. There is no hype, overstating or false claims. Just facts. Isn’t that refreshing? The below video of My Florida Green’s Dr. Mark Hashim and Nick Garulay should encourage anyone suffering from debilitating gut health disorders. Once again, the incredible endocannabinoid system comes to the rescue. Crohn’s disease is a chronic inflammation condition that can start from your mouth and continue down through the entire digestive tract. It is most common to experience inflammation in the small intestine, but can affect the entire gut. This inflammation and swelling causes raw areas within the lining of ones intestines, which bleed. The intestinal wall can also experience a thickening that results in blockages. Crohn’s is often confused with ulcerative colitis which appears only in the large intestine, but it is not the same thing. Crohn’s disease often has patches of good intestine between infected tissue. Ulcerative colitis is a continuous section of disease. In Crohn’s disease the immune system attacks foods and substances that are beneficial to the body. During this attack the white blood cells build up in the lining of the gut. The accumulation of the white blood cells in this manner triggers further inflammation which leads to painful ulcerations. 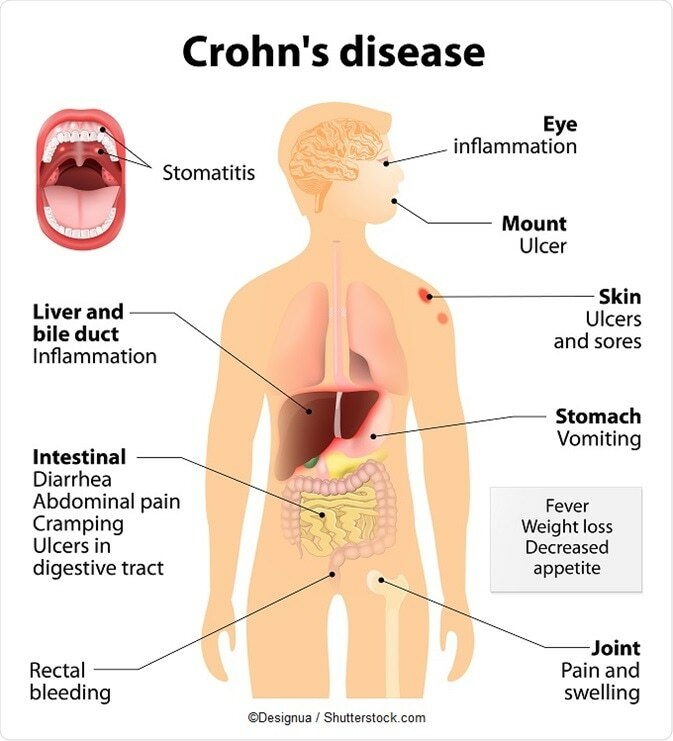 Crohn’s disease is a chronic condition. This means that there are times when the symptoms flare up and times when it appears to go away. Yet, the disease often lingers without being noticed. Alcohol and certain irritating foods are contraindicated. Conventional treatment involve corticosteroid drugs like prednisone, synthetic anti-inflammatories like mesalamine, immunosuppresants like methotrexate, surgery, or a combination. As you may already know too well, these conventional treatments often come with long lists of side effects. To name a few: glaucoma, osteoporosis, impaired liver function, fetal abnormalities, and increased infection risks. Knowing the risks of conventional treatment, we have to ask ourselves: Is there a better treatment option? Could a Florida Medical Marijuana Card for Crohn’s be the answer? Research into the human Endocannabinoid System is bringing fresh perspectives on not only better ways to treat many gut health conditions, but also intriguing possibilities about how to prevent them in the first place. Ailments such as inflammation, nerve damage, hormonal imbalances, autoimmune reactions and much new research points to gut health playing a key role in many seemingly unrelated conditions . Parkinson’s, heart disease, poor immune system, mental health disorders, and various skin problems are all showing connections to gut health and the Endocannabinoid System. Did you know that the microbiome, an intelligent bacterial ecosystem in your gut, actually makes up the majority of your immune system? And guess where there are a multitude of cannabinoid receptors? Many conventional Crohn’s drugs seek to reduce inflammation and suppress the immune system, which is continually attacking the gut. Researchers think that this is where cannabis can help. Cannabinoids have “immunomodulatory” effects. This means they can prevent the immune system from releasing pro-inflammatory proteins and trigger anti-inflammatory compounds instead. Scientists are far from pinpointing exactly how the endocannabinoid system is implicated in Crohn’s. Yet, the current discoveries on the subject hint that cannabinoid therapies are serious contenders in the treatment of the disease. In a 2013 review, authors Rudolf Schicho and Martin Storr explain that patients with irritable bowel diseases such as Crohn’s, produce fewer endocannabinoids, the body’s natural THC. They also state that certain cannabinoid receptors are overexpressed (upregulated). Upregulation is a sign that the intestinal tract is calling out for more cannabinoid inputs. When your endocannabinoid system’s CB2 receptors are activated, the amount of programmed cell death (apoptosis) increases for T-cells and the number of T-cells decreases. Additionally, fewer white blood cells, including T-cells, neutrophils, and macrophages, are called to the site of damage or potential damage. Therefore, damaging inflammation is reduced! This is a big deal. When the epithelial lining of the GI tract becomes leaky (commonly known as “leaky gut”), it allows substances from the interior GI space, including bacteria, to travel into the surrounding tissues and find their way to other areas of the body, where they don’t belong. This can lead to overload of liver detoxification mechanisms and immune system issues, which can compromise normal and healthy body functions. Additionally, inflammation caused by “leaky gut” stimulates further inflammation of and damage to the epithelial lining of the GI tract, creating a dysfunctional cycle. Therefore, increased leakiness of the epithelial lining can cause an increase in Crohn’s symptoms, as well as damage to other body systems. It’s a vicious and debilitating cycle. An Israeli study in 2013 in Clinical Gastroenterology and Hepatology, involved the effects of Cannabis Sativa on patients and their symptoms of Crohn’s disease and Irritable Bowel Disorder (IBD). It included 21 patients (13 men and 8 women) suffering from Crohn’s disease and other intestinal disorders in a controlled setting. The average age of the participants was 40 years old. Every single person involved in this study had previously tried treating their disorder with steroidal therapy, immunomodulators, or anti-tumor agents with no meaningful results. The researchers and Medical Marijuana Doctors split the patients into two groups, eleven of them were given rolled cannabis to smoke that contained 115 mg of THC, two times daily. The remaining group acting as the placebo group were also given rolled cannabis to smoke, only this time it contained no THC. In this day and age of misinformation, hype and fake news, it is often shared personal experiences that begin to organically rise up into greater demands for more research and access. “Hey there. I am new to this forum, but I do have experience with conventional medication and cannabis use. I have been on prednisone, immuran, humara, remacade, methotrexate, and more pain killers then you couldn’t ever imagine. I had so many side effects that I was so sick for years. The pain can be absolutely unbearable, abdominal pain, cramping, diarrhea, constipation and malnutrition. I have tried everything that is out there, nothing made me feel pain free then cannabis. As soon as I tried it over a year ago i actually found something that made me feel normal again. The extreme pain was gone and I could eat again. Matthew Lonsdale: Lonsdale, a longtime Crohn’s sufferer, is off of all pharmaceutical medications. After getting his Medical Marijuana Card he became an advocate for Medical Marijuana for Crohn’s with passion. Shonda Banda: Six years ago, Banda self-published a book titled Live Free Or Die. She wrote the book after discovering that cannabis oil was the life-saving medicine that she needed to overcome Crohn’s Disease. After discovering Rick Simpson’s video, Run From The Cure, she began experimenting with cannabis oil. The oil transformed her life. Within three days of trying cannabis oil, Shonda no longer needed to use her cane. She could stand upright and her life changed forever.